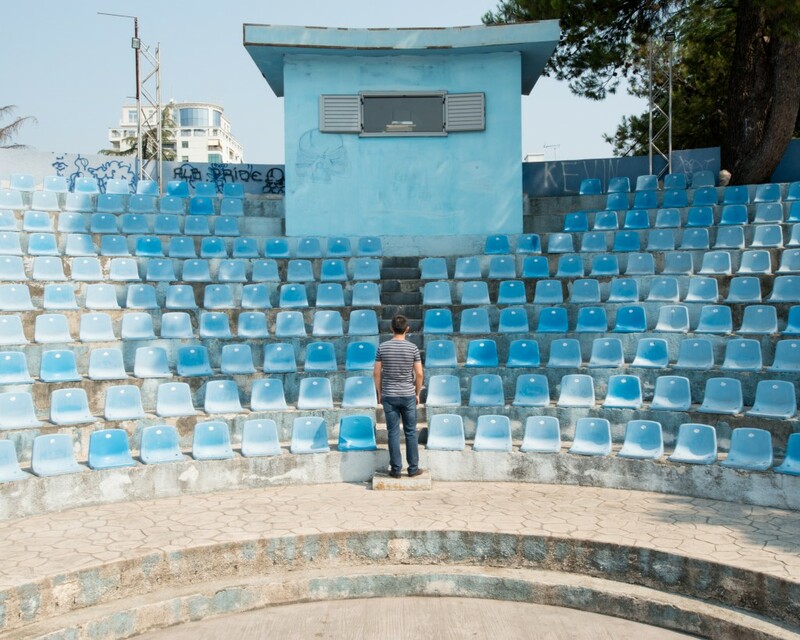 June 10 2018, 11:00 a.m.
By the time Debi Cornwall landed in Algeria in May 2015, in search of a former Guantánamo Bay detainee, the first phase of her photography project on the prison camp was complete. She had visited the U.S. base in Cuba three times in the previous year, making photographs that strictly complied with the rules: No faces or full-frontal views of anyone on base, no sensitive infrastructure or communications facilities, no panoramas of the site, and so on. She pushed where she could, seeking fresh insight on the place, despite the restrictions. Of course, Cornwall made photographs “inside the wire” — the prison camp itself, or the parts where visitors were allowed, a shadow zone where the imprisoned were less seen than implied, by means of showcase cells and empty recreation pens. But equally, she turned her lens on Gitmo outside the wire, a place where over 5,600 service personnel, contractors, and family members live, most with no involvement in the prison. Her images around the base did not break protocol — the censors would have deleted them — but they expanded her view, helping Cornwall see Gitmo as a social place, albeit one with a black hole of extralegal detention, violence, and secrecy in its midst for now 16 years and counting. She stretched in method too: By the third visit, Cornwall felt emboldened to ask permission to use medium-format film, whereas only digital photography, easy to review and delete, was allowed. By dint of stubborn negotiations, she became the first outside photographer allowed to use film at Gitmo. This required bringing in equipment to set up a darkroom in her hotel bathroom to develop and dry her photographs under constant watch. But all of this was, in a sense, preliminary. A New York-based photographer who spent 12 years as a civil rights lawyer before returning to art, Cornwall initially set out to make portraits of Guantánamo’s survivors. Some of the men released from the camp after years of isolation had returned to their home countries; others were parked in limbo, in host countries where they knew no one. Their situation reminded Cornwall of her law clients: Her focus had been wrongful incarceration cases in the United States, an all-consuming practice that had left her constantly outraged and eventually drained. She had kept in touch with many of them and knew how alienating the re-emergence into “freedom” could be. Now, after taking photographs at Gitmo and having reached ex-detainees through their lawyers, or in some cases on Facebook, she had a few ready to take part, in principle. The first — and the reason for her trip to Algiers — was Djamel Ameziane. An Algerian Berber, he was sent home in December 2013 after 12 years in Guantánamo, including five awaiting transfer after being cleared for release. Ameziane had bided his time with art, making skillful watercolors of interiors and landscapes. Cornwall was carrying a package of art supplies from his lawyers. But a problem arose: Ameziane had gotten cold feet. “Hello Debi,” he wrote, in under-punctuated but courteous English. “I am so sorry I cannot meet with you, I am going through a difficult time lately I don’t talk to people even to my own family only when I have to.” He wished her a pleasant time in Algeria. Cornwall recognized the depression. It expressed the kind of personal toll she wanted to present to a public saturated with “war on terror” images and ideology. But she couldn’t do it if the subject refused. She decided to make the trip anyway. If nothing else, she wrote back, she wanted him to receive the gifts. “Welcome to Camp America,” Cornwall’s Guantánamo book, appeared last fall. It made multiple critics’ best-of-2017 lists and was shortlisted for the Paris Photo-Aperture First Photo Book Prize. It mixes photographs with snippets of redacted documents and essays by Cornwall, photography scholar Fred Ritchin, and the British former Guantánamo detainee Moazzam Begg. Interspersed through the book is a story: a dramatic edited version of legal testimonial about a violent incident in the prison, which mounts like a page-turner towards an unexpected climax. All the text is in both English and Arabic; Cornwall hopes to produce a French and Arabic version as well. 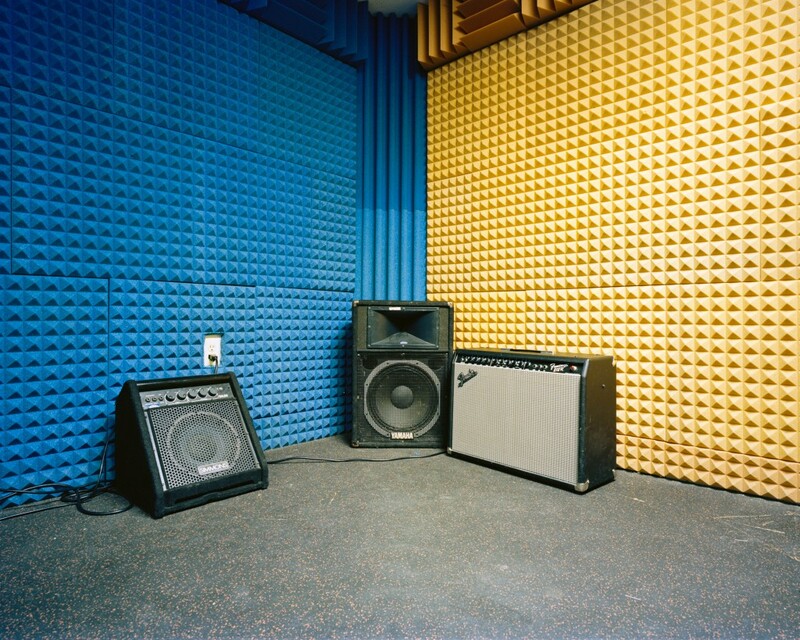 The project is also an exhibition, which made its debut last fall at Steven Kasher Gallery in New York; this summer, it is on view at the Philadelphia Photo Arts Center, where it runs from June 14 to August 25. The exhibition includes an audio component, with a sound station and audio downloads of French poet Frank Smith reading from “Guantanamo,” his 2010 collection of poems that manipulates excerpts of tribunal transcripts. In fact, all of Cornwall’s work is in some way collaborative. The portraits of ex-detainees that she made in nine countries were jointly staged by photographer and subject; 14 are in the book as unbound inserts, as if to signify both placelessness and release. And her photographs at Gitmo are in a sense collaborations, too: In this case, a kind of forced collaboration between the artist and her military minders charged with approving every shot she set up, and with the censors who reviewed her images every evening. The war on terror, or however one calls it, has engendered a substantial critical response by artists over the years. All of it involves a degree of constraint in the making, and indirection in the result. This is unavoidable: Because the whole military and political enterprise runs on secrecy, artists must navigate a host of arbitrary barriers. And by the same token, because actual facts are so hard to obtain, even conceptual art projects have an investigative value, and even a kind of evidentiary force. The original Gitmo artists are the detainees themselves. Like Ameziane, a number have made work while incarcerated, and an exhibition by eight of them, of whom four have been released and four are still detained, was held at John Jay College of Criminal Justice in New York last fall. Soon after the exhibition went up and attracted media coverage, the military suddenly changed its policies, asserting ownership of any art made in the prison, and threatening to confiscate inmates’ work and destroy it. The entire apparatus of permanent secret war, arbitrary detentions, rendition flights, torture, drone strikes, and the stilted bureaucratic choreographies that accompany these measures — intended at once to justify, document, and conceal — has spurred art and writing that connects into broader thinking about technology, surveillance, and contemporary modes of control. These works span a considerable range of subject and form. They include, for instance, the poetry of Solmaz Sharif, the Iranian-American author whose acclaimed 2016 collection “Look” redirects language from a U.S. military dictionary into personal narratives of intimacy, coercion, and loss. Also featuring prominently in this milieu is the interdisciplinary artist Trevor Paglen, a 2017 MacArthur “genius” awardee whose work links science, photography, and video to diagram and investigate the ever-spreading secret geography of military activity, data harvesting, and restricted information flows. The British photographer Edmund Clark, meanwhile, has traveled the sites of this permanent conflict for a decade — some in person, photographing from Guantánamo to Libya to Afghanistan, and some through the documentary record, which he marshals into multimedia installations. An exhibition of his work showed this winter and spring at the ICP Museum in New York, where it ran concomitantly to an exhibition of photography of the Japanese-American roundup and incarceration in World War II, building a deliberate (and deliberately disturbing) historical connection. The entire apparatus of permanent secret war and its stilted bureaucratic choreographies has spurred art that connects into broader thinking about technology, surveillance, and contemporary modes of control. A separate show recently at Flowers Gallery in New York featured Clark’s photographs of Bagram, the U.S. air base in Afghanistan. Titled “The Mountains of Majeed,” this project includes outdoor images that stretch the view from within the base grounds toward the surrounding mountains, as well as interiors at the base that include wall paintings of landscapes that the authorities commissioned from Majeed, a local artist. Most personnel at Bagram cannot go off base — Clark’s photographs place the viewer in their position. They reveal the occupier’s paradox: trying to hold territory without being fully in it. Clark photographed at the prison as well; his book “Guantánamo: If the Light Goes Out” appeared in 2010, and some work from that collection appeared in the ICP show. 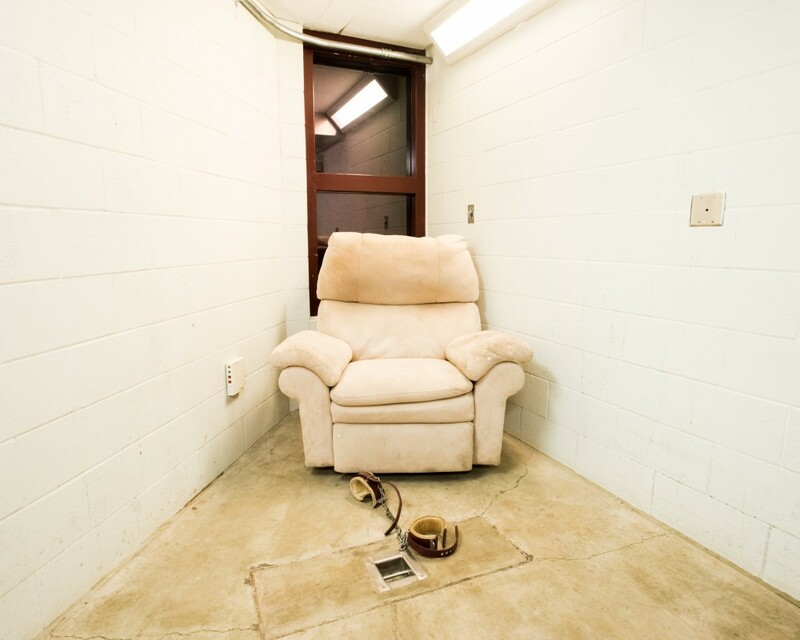 Cornwall’s project in part updates Clark’s — and connects, too, with the work of photojournalists who have shot at Guantánamo over the years. All the photographers, whether journalists or documentary artists, faced the same restrictions, resulting in certain tropes: soldiers facing away, sample cells, the weirdly idyllic landscape. 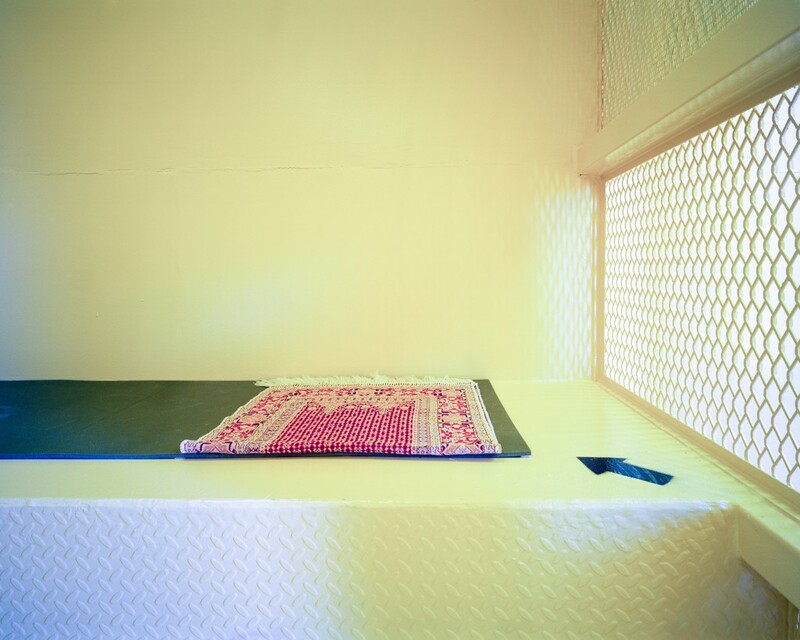 Cornwall emulates Clark in another way, albeit with a difference: Both artists use a conceptual gesture that echoes the photography conditions on base to examine the lives of released detainees. When Clark visited ex-detainees, he made interior photographs of their current home, without showing them at all. Cornwall, in contrast, made portraits, but they are indirect, as she imposed on herself the Gitmo rule of not showing their faces. For the broad majority of the base’s inhabitants, the prison camp was more or less immaterial, except as cause of the flow of visiting reporters and lawyers. With the minor disadvantage of being surrounded by a hostile nation, preventing off-base travel, Gitmo was a friendly American town on a tropical beach. Most residents weren’t even allowed to know what went on “inside the wire,” let alone be involved in the dirty work. To capture this oddness, with its balance of the sinister and the mundane, Cornwall found an approach that worked on both sides of the wire. Made by necessity in daytime, her images turn the brash tropical light into an advantage, bathing the exteriors in a washed, vaguely melancholy glare, in contrast to the institutional fluorescent of the interiors. 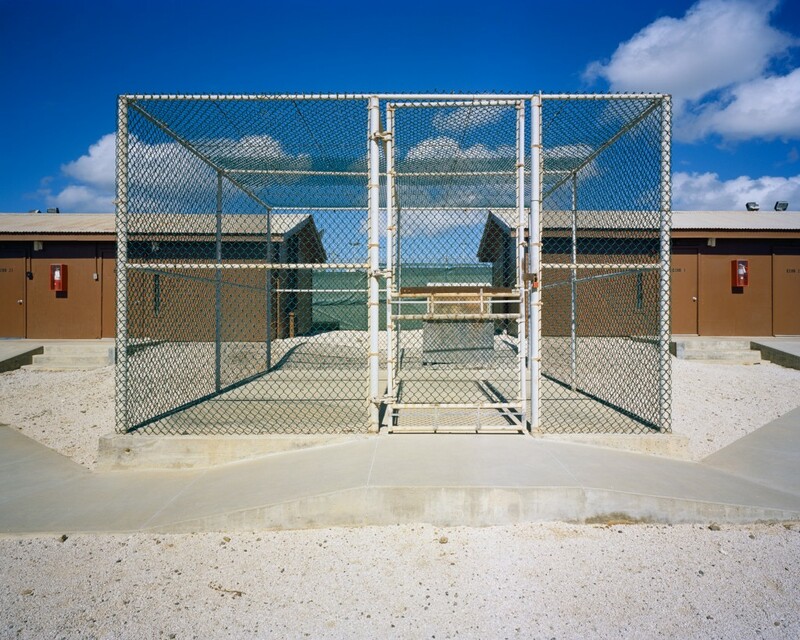 The photographs are mostly depopulated, but even when people appear — only service members, never detainees — they seem ancillary, blips in a desolate geometry. There is an actual Camp America on the base, a 24-hour recreation room for personnel working in the prison camp. 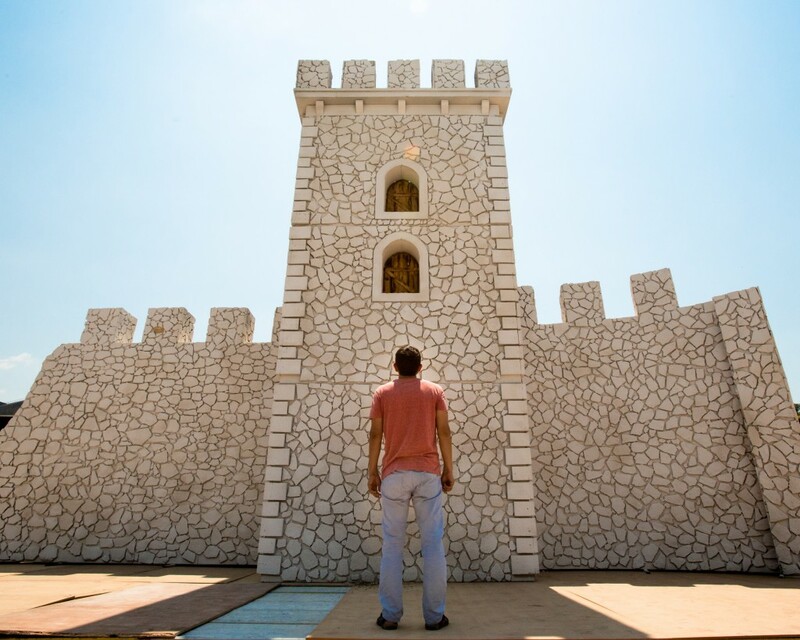 But “Camp America,” for Cornwall, extends to the broader setting — a place with stores, playgrounds, schools, a bowling alley, swimming pools with floaty toys, a gift shop. We see a sports field, its unlit scoreboard at center frame, tall against the background of gentle hills; store shelves stacked with cartons of Camels and Kools under a drab drop-ceiling; three male soldiers in camo fatigues standing around a small table on a concrete patio by the beach, staring toward the horizon across a frothy cobalt-blue sea. Cornwall mixes these images with the carceral ones. For every image that feels familiar, there is another that breeds a fresh kind of upset. The book’s cover, for instance, shows a dreary cinderblock-walled room. An armchair dominates the space. It looks reasonably comfortable, but there is a leg shackle in front of it, connected to a bar in the floor. This is the space where detainees, as a privilege, may watch one of the camp’s DVDs, shackled and observed by guards through a one-way mirror. Djamel, Berber (Algeria). Held: 11 Years, 11 Months, 18 Days. Cleared: October 9, 2008, and May 8, 2009. Released: December 4, 2013. Charges: Never Filed in U.S. Acquitted and Exonerated at Trial in Algeria. Djamel Ameziane agreed to meet Cornwall, briefly, in a hotel lobby in Algiers. She handed him the gift package of art supplies. Then they sat together awhile and didn’t talk about much of anything. There is a portrait of Ameziane in Cornwall’s book. She made it in a small town, about an hour outside Algiers. Ameziane was living there, jobless, camping on a mattress in his brother’s house. In the photograph he stands outside, under an overcast sky. He is looking down a hillside street into a vista of gray and brown houses and overgrown weeds. His sweatshirt and trousers are too big. His hair is close-shorn, thinning at the crown; we see wisps of a beard. But he is looking away, so we can only guess his expression. The set-up invites the viewer to share in his alienation without really knowing it. He appears fragile. Our position, close behind him, is protective. We could catch him if he fell. There have been over 700 detainees released from Gitmo; Cornwall does not pretend the 14 she photographed are a representative sample. Still, their circumstances span a gamut. The Sudanese journalist Sami Al-Hajj — arrested on his way into Pakistan, leaving Afghanistan with a visa to report for Al Jazeera, tortured, and held at Gitmo for just under six years with no charges — is comparatively fortunate. He returned to Al Jazeera and his family received Qatari citizenship. In Cornwall’s portrait, shot from behind, he stands clad in a Gulf-style white thobe, looking toward a farm of satellite dishes at the network’s headquarters. In another portrait that is not in the book but appeared in the New York exhibition, he is seen in profile in a different kind of isolation: in the anchor’s chair in a sleek modern TV studio. Sami, Sudanese (Qatar), Al Jazeera Cameraman. Held: Five Years, Four Months, 16 Days. Released: April 30, 2008. Charges: Never Filed. Al Jazeera International Headquarters. Some of Cornwall’s subjects are familiar names in the human rights and law community that has formed around the war on terror. Moazzam Begg, for instance, has become an activist in the U.K., authoring a book, making TV appearances, and penning op-eds. (In her titles, Cornwall identifies subjects by first name only, but many are widely known by their full names.) Yet others are largely forgotten, consigned to a kind of purgatory in countries where they have no connection and cannot speak the language. In Albania, Cornwall photographed one Uzbek and three Chinese Uighur men who asked to remain anonymous. None of them had been given the identity cards that Albanian residents require for common transactions, such as getting a cellphone. Cornwall’s lawyer side surfaced, thinking she could help the process. “I wrestled with my subject position,” she said. To no avail — her entreaties to government figures yielded nothing. Terry, American (Arizona). United States Army Veteran. Deployed to U.S. Naval Station GTMO: 2003-2004. Assignment: Joint Task Force (JTF) Guard. Converted to Islam: December 29, 2003. Honorably Discharged. Even people with the best reasons to resent America, Cornwall found, may cling to a shred of belief. When she arrived in Slovakia to photograph Hamza, an ex-detainee from Tunisia marooned there after spending nearly 13 years in Gitmo without charges, he had recently had a confrontation with Slovakian police who, under the guise of checking on his whereabouts, came to his apartment, ransacked it, and arrested him. He had left the place that way, the door off the hinges and rubber bullets strewn on the floor, so Cornwall could bear witness and, he hoped, get him help from a competent agency. Top photo: Smoke Break, Camp America.